Lexington Golf course at Revere Golf Club is located just minutes from the Las Vegas Strip, in Henderson's upscale, master planned community of Anthem. This Troon Golf facility is themed after Paul Revere's historic midnight-ride and offers 36 championship holes, a 'Battlefield' practice facility, (including driving range, putting greens and practice bunker) and a 23, 000 square foot clubhouse. The Lexington Course offers unending, awe-inspiring views of the city below and mountains beyond. Its stunning 7, 143 yard, par-72 layout will test your shot making capabilities with classic risk/reward scenarios. This all rye grass-based course is more of a desert target course with plenty of forced carries. Unlike many desert courses, Lexington is also home to numerous beautiful water features that highlight the rugged terrain. In the desert, there are many things you can expect to see. Scorpions, snakes, tumbleweed, and sand have a better than good chance of showing up while sightseeing in an ordinary, expansive desert. In terms of photo-ops, the typical desert is usually a little bland. Las Vegas, of course, is not any typical desert city. 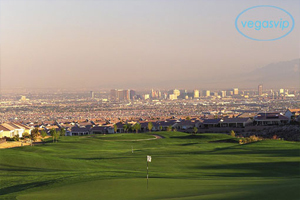 Built in the southern tip of the city of Henderson, located about 20 miles south of the Las Vegas Strip, is an expanse of green, rolling hills belonging to the Revere Golf Club. At first glance, Revere's grounds look more like misplaced grasslands, decorated with tall ferns – a nice change of pace from the usual palm trees. At one edge of the property, visitors can experience the site of a waterfall trickling down a nearby mountain face without traversing far from safety and civilization. 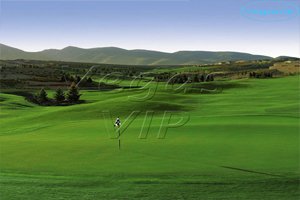 A closer inspection will bring to light the fact that this open prairie is home to one of Nevada's best golf clubs. Revere utilizes the union of two completely unique individuals to ensure that the courses are both awe inspiring and practical. Famed architect Gregory Nash and PGA Pro Billy Casper are responsible for some of the world's most visually appealing courses, and the two were once again called upon to design for Revere. Their strategic placement of hazards, use of wide landing areas, and emphasis on large greens has given the critically acclaimed team the credibility they hold today. Indoors, Revere is home to one of the top 100 golf pro shops in the world. Vendors like Ecco, Oakley, Devant, Oxford Golf, and Adidas Golf have all made the Revere Golf Shop the home to much of their merchandise. When your stomach starts to grumble, Buckman's Grille offers fine dining with a breathtaking view of the grounds. To make use of the incredible landscaping, guests are welcome to use Revere as their choice of wedding venue. Unlike many other golf clubs, Revere offers a wide range of wedding amenities from ice sculptures to a dance floor. Buffet style dining will ensure your guests the chance to get up from their seat and appreciate the view. Beginner golfers can make use of the four hour training courses under the instruction of one of Revere's professional teachers. Two hours of the course will cover a long list of golfing fundamentals from putting to grip techniques before taking to the course for another two hours of hands-on training. Pricing for the four hour lesson is a bit high, but also includes lunch and use of the clubs equipment, and its 4-student maximum ensures a personalized experience for the money. With awards like Golf World's "2010 Readers Choice Award" and a four and a half star rating from Golf Digest, Revere remains a must visit location for both golfing fanatics and beginners. Its location away from the big city ensures a peaceful experience with much to see and observe.